Cyclist or Bike Rider? Also, Shameless Plug. In the last post we talked about the ways that bicycles are portrayed in media, and how it would be nice to see some normal bikes out there in the public eye. This brings out an interesting conversation about the difference (if any) there is between the idea of a Cyclist and a Bike Rider. There are Cyclists who swear by shaving their legs, and there are Bike Riders who swear by fat road tires and fenders. As you could imagine there are also retailers, journals, and magazines tailoring to these different types of riders. A recent article at BikesForTheRestOfUs has done a pretty awesome comparison of the two ends of the camps and what they have to say to beginner riders. Bicycling Magazine: Bike shorts wick sweat and make riding comfortable. A section of padding, called a chamois, is sewn into the seat of the garment to help prevent chafing. Grant Petersen: The benefits of tight shorts with padded crotches matter only to racers and mega-milers. For anybody else, and for recreational rides, even vigorous ones lasting the better part of a day, a good saddle, smooth-seamed shorts, and standing up now and then are all you need. BM: Buy the highest quality bike you can afford. For $500-700, expect entry-level components; a frame made of no-frills steel or aluminum; basic wheels. For $1,000 to 1,500, expect mid or entry level parts; a midquality steel or aluminum frame, maybe with carbon fiber mixed in; lighter, stronger wheels. For $1,500 to 3,000, expect upper-level components; a frame made of some high-quality aluminum or steel or midlevel carbon; lighter wheels. GP: The lighter bike is good for maybe five years before it breaks or you just don’t trust it anymore. The heavier one may easily last twenty or thirty years because it can withstand scratches and minor gouges. The more useful steel bike let’s you ride tires up to 38 mm so you can ride it over any paved surface with remarkable comfort, because you can lower the pressure in the wide tires. It fits fenders, so it’s a year-round, all-weather bike, not a part of the year, good weather one. A weight difference of a few pounds is hard to get worked up over, especially when the “extra” weight makes the bike better. I think that both sources have a lot to offer in their own respect and that neither is 100% right or 100% wrong. In the end we all love bikes, and we all love riding. So what if my bike weighs as much as one of your panniers, as long as we are both having a good time. It is fun to see what the different perspectives are concerning what is ‘necessary’ and what is not. My personal take is to combine the two mentalities and get the best of both worlds. If you want to go on tour and only have a beach cruiser jump on it and get pumping. But what’s that you say? You have money for some padded shorts? Well, if you think you will need them buy those padded shorts then pedal that beach cruiser to horizons far and wide. The only way to tell what you need and do not need is by getting in the saddle and really checking it all out. I’ll see you on the road/polo court/mountain/skatepark. I will be the guy with the hairy legs and Bern Helmet. I have recently done some writing in a physical format that some of you may enjoy. The following is the first installment of a three part Zine series I am doing about being a bike nerd which is based off of a post I did awhile back here on BikeProvo. 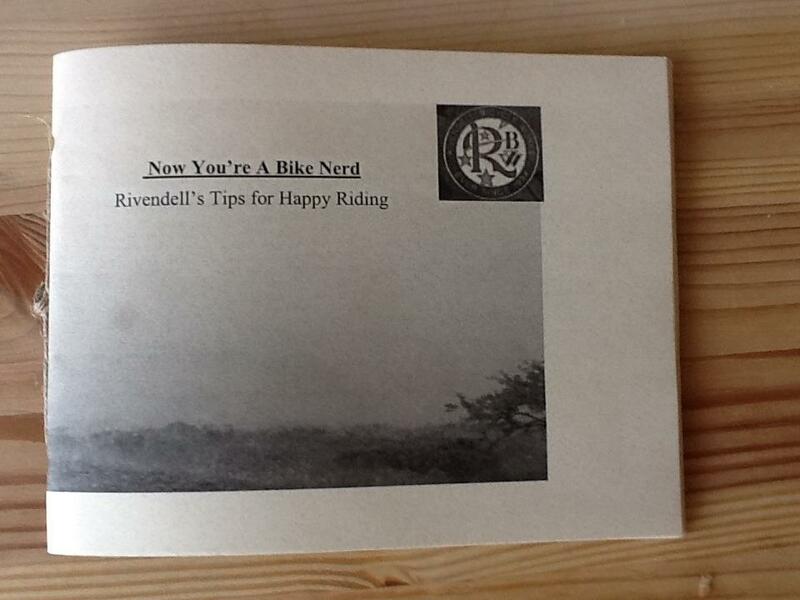 They are aptly titled “Now Your A Bike Nerd.” The first installment is Rivendell’s Tips For Happy Riding and is only $2. Each copy is printed on Rivendell appropriate paper, and is bound with twine. You can pick up your copy either at the Bike Collective or by emailing me directly zwhitmore@gmail.com. 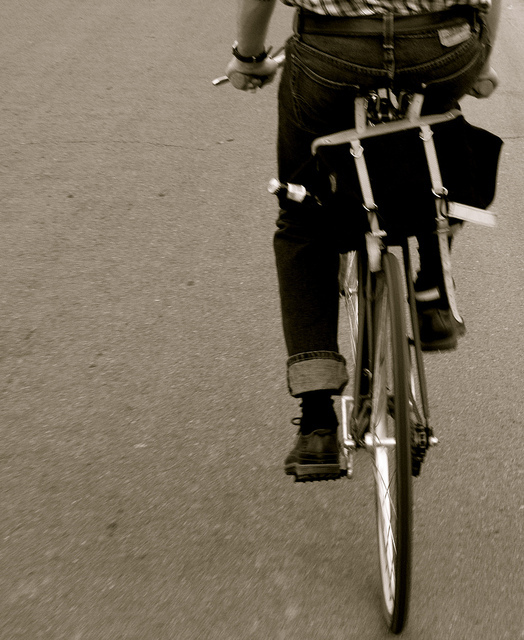 This entry was posted in Bike Advocacy by Zac. Bookmark the permalink. Awesome! Zac, have you read Just Ride and what do you think of it? Tod, I have not read all of Just Ride yet. Look for a review coming soon to the site :).